Pergolas with retractable roofs are one of the most popular high-end outdoor shade structures in Miami and throughout Florida and the southeastern U.S. Our pergola systems are customized to fit your pool deck, terrace, patio, or outdoor seating area. ShadeFLA pergolas, designed by the Italian firm Pratic, are both stylish and functional because of the addition of a retractable roof system. The system smoothly retracts at the push of a button, so you can create or remove shade as you wish. The roof is made from high quality waterproof fabric, so it is also practical for protecting your guests from rain. The retractable roofs can be used at hotels, private homes or to create a shaded walkway and are especially recommended for commercial or hospitality applications. The retractable roof system also offers the ideal outdoor dining shade solution. Restaurants and cafes have been able to expand their seating by maximizing outdoor space with retractable roofs. When it is too hot and sunny to enjoy the 0utdoors, simply press a button to roll out the roof and keep your customers comfortable. Once the sun goes down and temperatures cool, retract the roof so everyone can enjoy a view of the stars. The pergola roofs can also be used to keep everyone dry in a sudden rainstorm. 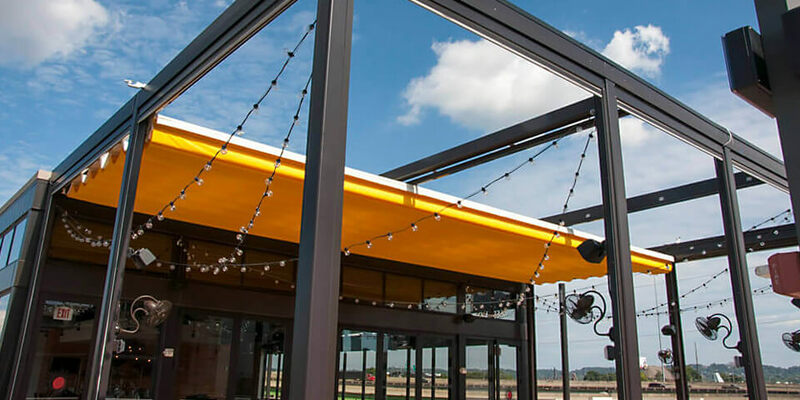 The retractable roof systems are a particularly good fit for restaurant and hotel patios as they help to boost revenue by creating a unique ambiance and keeping clients protected from sun and rain. The systems are modern yet classic and elegant and suit most outdoor spaces. Because the roofs are customizable in every way, they are the perfect solution for any outdoor space. They can be transformed into an incredible space with LED lighting, heaters and screens as well as with various fabrics and colors to suit your style. You can choose the size, shape and color of your pergola, as well as upgrade with the addition of a patterned faux ceiling, cooling fans, ambient lighting, and more. We use only high-end, commercial-grade materials that are specifically made to withstand harsh weather conditions. With these shade products, style and practicality go hand in hand. Our versatile trellis pergolas and retractable deck shade systems can be either free standing or attached to an existing structure. These custom shade structures add character and value while simultaneously enhancing any building or home’s architectural style. We can attach a retractable system to your existing pergola, or construct an aluminum pergola as a rust-free, low maintenance option.